The Plastic Tide, a charity made up of ocean, science and tech enthusiasts committed to working out ways to clean up our beaches and oceans of marine litter and plastics. 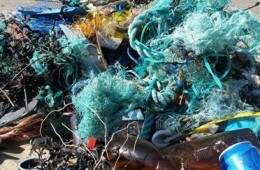 Their ultimate mission is to create a machine learning algorithm that can automatically detect, identify and monitor marine litter in images supplied by armies of drones surveying beaches. This will offer, for the first time, a tool that can help us understand not only where plastics and marine litter goes but what kind and how much. They are starting with beaches but will soon extend imaging to the seabed and sea surface. You can begin clicking images now – but the official counter will be put up during British Science Week (10-19 March). Ocean waste is having a huge impact on wildlife, as many of our precious sea creatures are ingesting as well as getting trapped in plastics, which harms them and the food chain – which could even include us!